Courageous patriot and freethinker has been sentenced to jail once again for doubting Jewish atrocity tales. 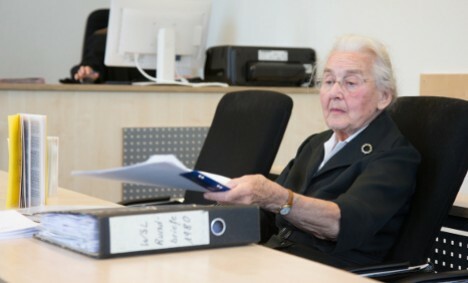 URSULA HAVERBECK-WETZEL (pictured), 87, has been sentenced by a district court in Bad Oeynhausen, North Rhine-Westphalia, to 11 months imprisonment without parole, Süddeutsche Zeitung reported on Tuesday. Haverbeck-Wetzel was convicted for the crime of “incitement of hatred for denying the Holocaust” in a letter she sent to the Central Council of Jews in Germany, as well as on her website. In Germany, the crime of incitement of hatred refers to actions that encourage hatred or violence towards a group of people because of their religion, race or ethnic background. It also punishes any individual, who publicly “approves of, denies or downplays” the acts of the 1933-1945 National Socialist government of Germany by up to five years in prison. Haverbeck-Wetzel was sentenced to ten months in prison last November for incitement of hatred after she went on television to declare that “the Holocaust is the biggest and most sustainable lie in history”. A court in Detmold, North-Rhine Westphalia, also recently sentenced her to eight months in prison for her Holocaust denial — which she has appealed — and a further case is ongoing in Verden, outside Bremen. Haverbeck-Wetzel is well known among far-right groups, having been a member of two groups banned in 2010 for their extremist views: the “Collegium Humanum”, of which she was chair, and an association she helped found to help people who were persecuted for exercising their free speech with regard to WW2 history.